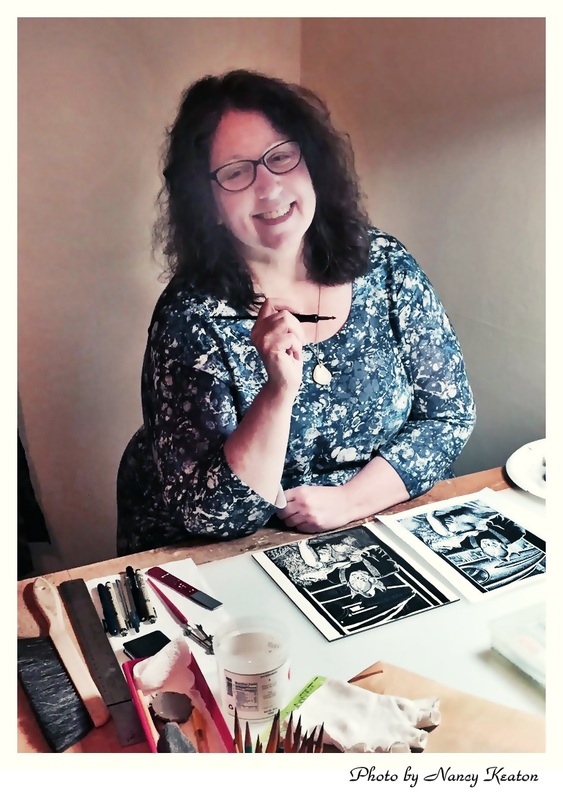 Nancy Keaton just wrote a lovely story about me for LewisTalk – “Sara Light-Waller Illustrates Hope through Old-Fashioned Pulp Fiction.” Thank you, Nancy, for the kind story, it’s a treat to be on the other side of the tape recorder once and a while. Sara Light-Waller’s first adult novel “Landscape of Darkness: A Novelette of the Space Patrol” was just supposed to be a design experiment, not a book. “I was showing an example of Coquille and looked at what I had drawn. I suddenly realized there’s a book in there,” she says with a tinge of amazement. Trained as scientific illustrator, her style of illustration is known as “Coquille” which uses a waxy pencil on bumpy paper. This allows a half-tone effect for black and white drawings, creating stunning, intricate pictures. Light-Waller started out writing in the fantasy area, but realized after a while that it wasn’t a good fit for her. Then she started writing science fiction and “it was like putting on comfortable gloves,” she says with a smile.